The 37th edition of SIBF, themed ‘Tale of Letters’, will listen to the next level leadership readiness expert telling ‘tales of leadership’ on the 4th day of the event. 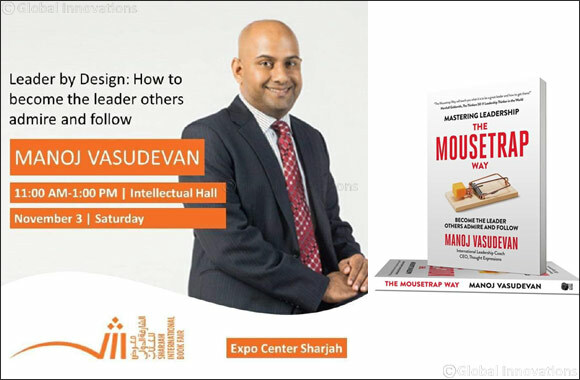 SHARJAH – November 1, 2018: The Sharjah International Book Fair (SIBF 2018) will witness Manoj Vasudevan, Toastmasters World Champion of Public Speaking 2017 from Singapore, offering a free online training program in leadership and public speaking to participants of his interactive session at the 11-day literary event. The 37th edition of SIBF, themed ‘Tale of Letters’, will also listen to the next level leadership readiness expert telling ‘tales of leadership’ to the book lovers. Manoj will deliver his presentation titled “Leader by Design: How to become the leader that others admire and follow” to be held between 11 am and 1 pm on November 3, 2018 at Intellectual Hall of Sharjah Expo Centre. The session will be a discussion, based on Manoj’s international best-seller “Mastering Leadership – The Mousetrap Way”. The participants will have an exclusive opportunity to grab an author-autographed copy of the book, along with certification and entry to his online training program - leadership strategies to attain the power of confidence, presence and persuasion in personal and professional transformation. Manoj, emerged as the World Champion of Public Speaking in 2017 at Toastmasters International Convention, the world’s largest public speaking contest, which is also known as the ‘Olympics of Oratory’. Manoj is currently running a social support program to empower 20 million people worldwide by the year 2020 to overcome their fear of public speaking. “There are tens of thousands of people from different parts of the world visiting the SIBF, and their fundamental objective is to gather intellectual resources to achieve their personal development and leadership goals with the habit of reading books. For the lovers of books and speeches, I love to share some of the world’s great lessons in practical leadership,” he added. “Public speaking is the perfect skill that can positively uplift an individual’s confidence. It is a skill anyone who can speak, can learn. Don’t worry about your accent. Focus on clarity of expression. If you know more than one language, you are bound to have an accent,” added Manoj, who has coached individuals aged between 7 and 77 years to overcome their morbid fear of public speaking with the help of latest technology. The techie-turned-management consultant and leadership coach is CEO of Thought Expressions, an international corporate coaching consultancy based in Singapore. He also runs an online technology-based training platform www.NervousToFabulous.com (NTF), aimed at empowering 20,000,000 individuals worldwide by the year 2020 to overcome their fear of public speaking. “My dream is to equip 20 million people to take at least one step out of their fear zone and get ahead with public speaking. “The Nervous to Fabulous program provides an avenue for individuals to share their biggest challenge in public speaking and seek solutions. The online platform will provide a free foundational programme on public speaking with the essential building blocks and roadmap to master the art of public speaking, no matter where you start. This program would be beneficial for both beginners and experienced speakers,” he added. The next level leadership readiness expert is known for his expertise in simplifying complex topics into practical strategies and helping individuals to breakthrough to the next level in their career. As a leadership coach and consultant, he works with major multinational companies in Asia, Australia, North America and Europe personally coaching professionals, bureaucrats, celebrities, UN diplomats, and entrepreneurs of more than 30 nationalities.